Yoga Accessories' Oversized Nylon Drawstring Yoga Mat Bag is roomy enough for two large yoga mats or one yoga mat and all of your yoga gear. Great for restorative yoga or other classes which necessitate the use of two mats. 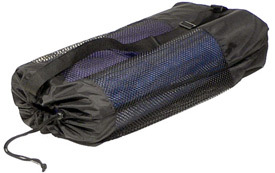 Our double mat bag has a drawstring closure and a comfortable adjustable shoulder strap for quick and easy transport. Featuring a large mesh window, allowing your yoga mats to breathe and dry out after a sweaty class. This bag is perfect for all of my yoga equipment. I have an extra thick mat, two four inch blocks, two belts, my blanket, water bottle and towel all tucked away in this bag. The bag is light, but sturdy and easy to throw over my shoulder for the walk to yoga class. I've recommended it for several of my yoga classmates. I'm very happy with this purchase. I have two of the thicker Yoga mats and finding a bag that would fit them both was not an easy task. I am very happy with the bag size. The bag is very large - you could fit three mats in it. It is a little bigger than I wanted, for my purposes I wish that it was a little smaller and/or had a bootle pouch on the outside, but if you carry a lot of stuff it is great! Huge! All my stuff fits! Currently, I have a mat, a hot yoga towel, a handtowel, a water bottle, block, strap, and matcleaner spray bottle in one bag! Several people in our yoga group have purchased this bag because of it's size and flexibility. You can fit an oversized matt, block, pad and strap into one bag easily and carry it all together. Makes it so much easier to transport and not lose anything. Love it! Once I used this bag my search for the best yoga bag was over. This bag holds two mats and yoga blocks. The built-in pouch holds my yoga strap, a packet of tissues and a pouch of rosin powder that when applied to my mat prevents my hands from slipping in down dog. The carrying strap is easy to hold and stays on my shoulder. Bag washes and air dries fast. One of the other students in my yoga class asked me where I purchased my bag because she wants one! I am very please with my bag. It holds 2 yoga mats as advertised and I even have room left for my yoga block. I love this bag. I love this bag. I prefer to have my own practice things when I go to class. The bag is large enough to hold not only my mat, but strap, and eye pillow and even has extra room. I am very happy with this. Very. I just love this over sized mat bag. It holds all my items (mat, foam blocks, knee pad and eye pillow) I take with me to my yoga class and when I work out at home. I like the netting and also the small inside pocket where I store my lavender scented roll on I use during meditation. this bag is very practical with (as stated on title). fits not just 2 mats but a lil' extra space for personal belongings, perhaps.